Sailing boat Bavaria Cruiser 46 named 'njoy has been built in 2018. We propose this boat from marina Trogir just a few kilometers from Split. 'njoy is certified for 6 crew members. Layout of the boat is 6. Bavaria Cruiser 46 'njoy has 3 cabins. For guests disposal there are 3 heads. With motor 75 'njoy can move really fast. 'njoy is 14.27 meters long and 4.35 meters wide. Draft is 2.17 meters. 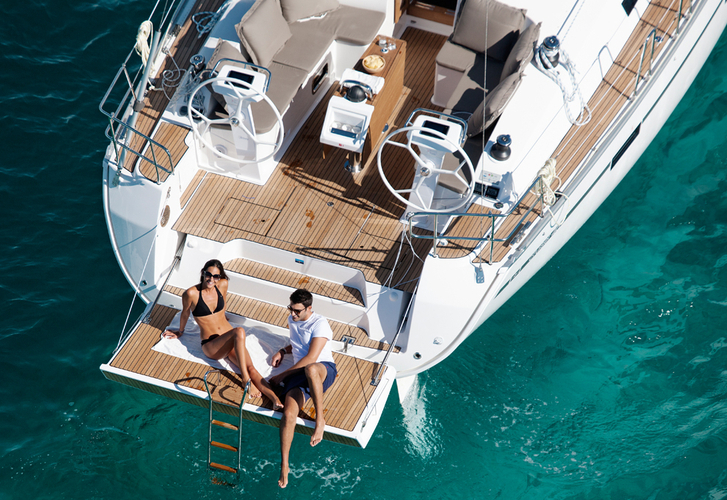 Analyze more offers in this site: Yacht charter Trogir. Boat's equipment includes : Dinghy, Teak cockpit, Anchor electric windlass, Bimini top, Autopilot, Gps, Plotter gps in cockpit, Wc pump electrical, Inverter 12v-220v, Heating, Bow thruster, Furling mainsail. . Caution is 2500.00 EUR. Choose our offer and spend great time on the deck of 'njoy. This Bavaria Cruiser 46 from Trogir from Croatia Use our search engine to find following this link: Yacht charter Croatia.